The beginning of the album, opening with tracks such as 'Better Off Alone' and 'Puppet on the Strings' are in their very basic format of energetic guitar build-ups and playground pitched vocals, good pop-punk songs. 'Sweet Baby Ray' is a track that is full of musical punk flurry from the very offset with vocals echoing that of the chorus brilliantly in what feels like a stand off between musician and singer. The track even feels like a stand off between band and listener with the introduction of a short but sweetly pitched growl that makes you feel as though American Verse plan on taking absolutely no prisoners, which is quite refreshing for an opening track. It's not however until we reach the fifth track in the EP, 'All I Know', that the album really begins to dip into a more comfortably manufactured, honest and peppy early pop-punk flavor. The tip of your tongue tastes and sings of emotional teenage ambiguity and front when American Verse 'can't stand with the weight of the world on my shoulders'. It's in borrowing this youthful woe from the prior track that the band next introduce 'Game Frouz'. Without attempting to sound all too simple or all too mushy it has to be said that this track is a great example of acoustic heartfelt pop-punk. Lead vocalist Dylan Massucco (brother to that of Four Year Strong's drummer, Jake Massucco) gives this track just the right mix between punk maturity and emo/pop youth that makes for a corker of a song. It probably should have been this mix between youth and maturity that should have taken the front seat so far seeing as tracks such as 'Cement Feet', with a whole opening minute of musical prowess, prove that American Verse are systematic; able to use a well paced tempo of drums and ringing electric guitars to permeate between the boundaries of pop-punk and rock. This EP is somewhat comparable to any movie sequence scene. First it presents the band, then works and plays with the music, to tie it up in a fun finale bundle all in the space of nine tracks. And although i'd consider them a movie to watch twice before gathering an opinion, sounding so much better the second time round with songs such as 'Game Frouz' really sticking it out, their honest homeland attitude already stands in good stead. 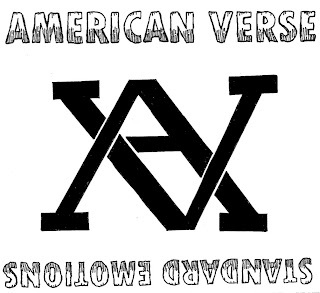 Unsigned bands like American Verse need to be welcomed into the pop-punk community with open arms considering they've managed to produce an album that already promises not so sugar coated musical muscle.